I’ve always agreed with the comedian Whitney Brown one thing: if I became a vegetarian it would not be because I love animals but because I hate plants. Thankfully someone heard my cry. Halfbrick has adapted their bestselling iOS game Fruit Ninja, bringing it the Xbox 360 and trading in touchscreens for full body tracking. Until the actualization of Fruit Ninja Kinect, there has never been an adequate way to unleash this pent up rage against nature’s bounty. All joking aside, coming into E3, I was skeptical if Kinect could handle the precision required for a title like Fruit Ninja. By the end of the week, I was not only a believer but an advocate. For those unfamiliar with Fruit Ninja, players slice open flying fruits trying to combo them for high scores. There are multiple game modes, some of which require players to avoid hazardous objects, such as bombs which end the rounds, or the wrong color fruit which subtract points. With Fruit Ninja Kinect, the body is tracked allowing players to move like a ninja instead of relying on just a finger swipes like previous versions. Only sharp, violent movements result in a slice, so players can continue to move around without unintentionally hitting the wrong objects. Every mode returns, and a few new ones have been added: live splitscreen co-operative play and splitscreen multiplayer, things that weren’t possible with a phone. In classic mode, players attempt to hit as many fruit as possible without hitting a bomb. Should they miss cutting three pieces of fruit or hit a bomb, the round ends. Arcade mode gives players a minute to combo up a high score. Various fruits have different powers. One will freeze the screen, while another causes a frenzy where dozens of fruit fly onto the screen for a short time. 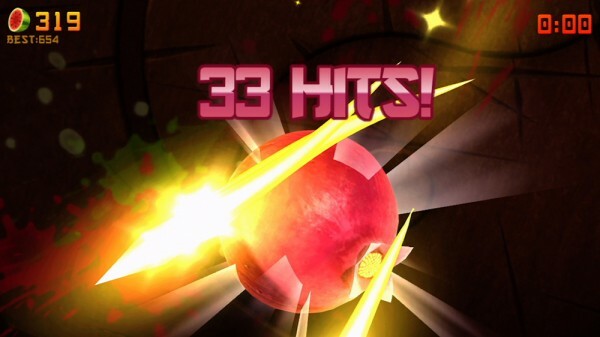 Periodically bombs will appear that when struck will cause players to lose points from their score. At the end of each round, a matrix fruit appears giving players a chance to attack it as many times as possible in a brief period of time. Zen mode gives players a minute and half to attack fruit without any hazards or power-ups. Multiplayer is where the game really shines. In co-operative mode, players attempt to work together to cut fruit. It’s just like the single player modes but with two people. Competitive multiplayer though causes a whole lot more insanity, as players are attempting to slice fruit at the same time to up their own personal scores. It’s just like the iOS multiplayer, but both players are in the same room, using the same screen and waving the arms at each other. One player will slice blue fruit and the other will slice red fruit. These two colors are split primarily onto their own sides, however the white fruit are neutral, worth more points, and can appear anywhere. Halfbrick told us they actually wanted players smacking into each other from time to time as it makes things more exciting. Dozens of unlockable items, including different blades and backgrounds, have been placed into the game to facilitate additional replay value. My personal favorite was a piano blade that played a note from the Fruit Ninja theme song with each successful slice. Halfbrick mentioned they would love to expand on this area of the game as well as even explore possible new game modes through DLC. In the end, Fruit Ninja Kinect is a much more active version of its iOS predecessor that still captures and retains the fun of its progenitor. The game is built for a party situation, as watching people slice fruit can be just as entertaining as playing. Especially with competitive multiplayer when feet make it into the mix. 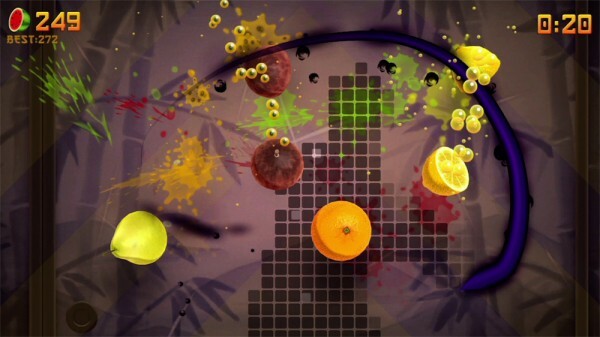 All in all, it is clear why Fruit Ninja Kinect made it into this year’s Summer of Arcade. It is one of the best Kinect games I have played to date, earning its place among the ranks of Dance Central, Kinect Sports and Child of Eden. 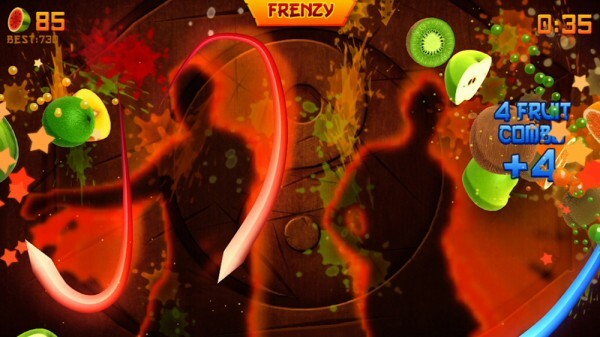 Fruit Ninja Kinect will be part of the Summer of Arcade promotion for XBLA. At this point a release date and price are still unknown.